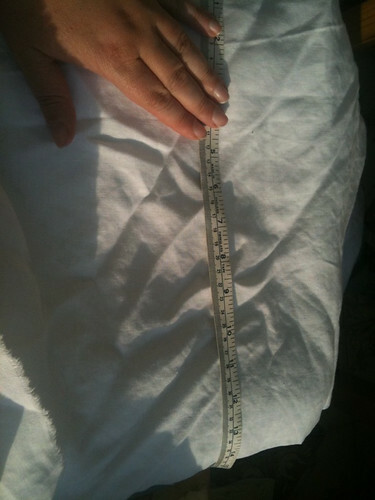 I measured up using the Tudor costume page to BB’s mid shin – 30″ and around her chest and made it looser to 24″ so overall as a rectangle i wanted 60″ plus hem margins [seem to be an inch per hem when i do them] by 12 inches plus hem margins. 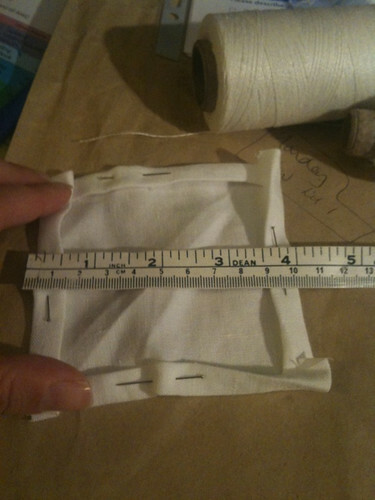 SInce the material was 60″ wide I decided to forgoe the extra inch in length… each arm was measured from shoulder to wrist with 2 inches added for seams, and around to look loosish to give me my 2 arm rectangles of 16 by 12. 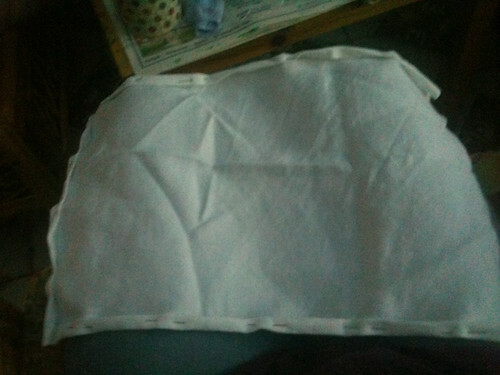 I have also cut out 2 6″ squares to be underarm gores [more later]! 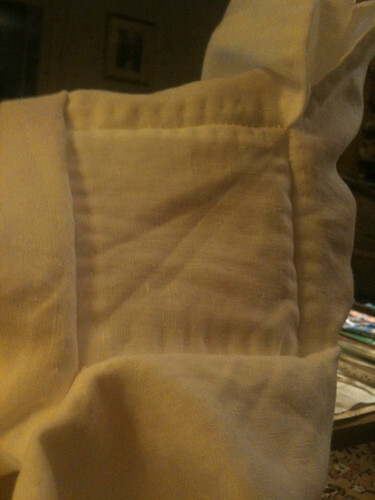 I hemmed the body rectangle along its 2 long edges having pinned first [I am getting better at straight edges, but variable still at remembering the seam allowance! luckilly not too short, and so just had to make sure they weren't too generous! Then I hemmed each arm on the 2 long lengths and 1 short length [ie 3 sides] Mys children were crafting with me at the same time in the conservatory, which made it very enjoyable. 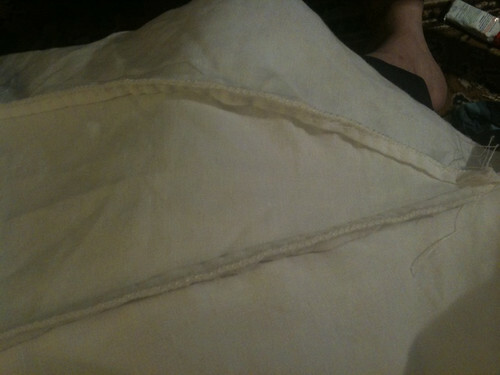 Next time I am going to pin these so that instead of going in the same direction on my lap, the knife pleats are facing front or back on both arms, rather than one arm facing front, and the other back. I have decided this is too small a deal to unpick! 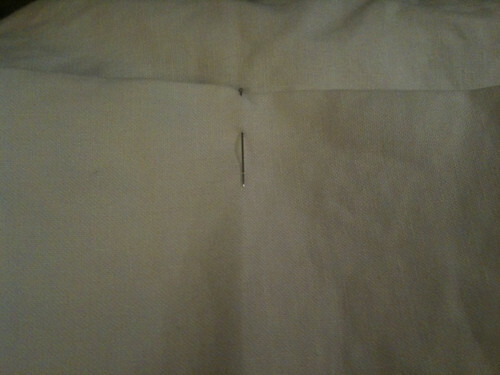 I then placed a pin at the midpoint of each longside of the body piece, and the midpoint of the hemmed short side for each arm, and lined these up. 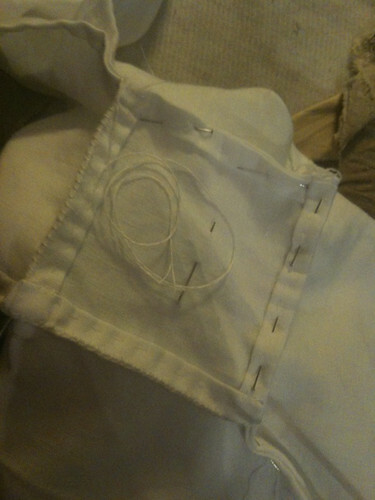 i pinned them right side to right side, with the midpoint pins lining up so that each arm was securely on, and checked that the arms weren’g going to be sewn in the wrong way round, as this is apparently a very easy and common thing to do. [and i am good at making mistakes!] . 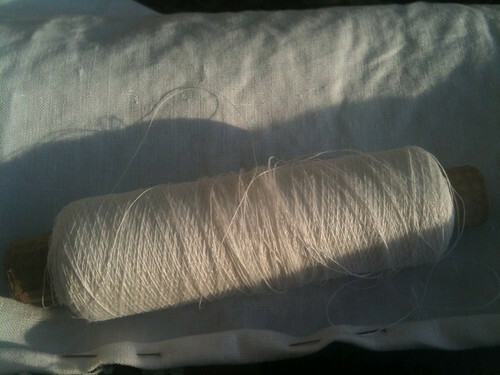 i then whipstitched the arms onto the body. 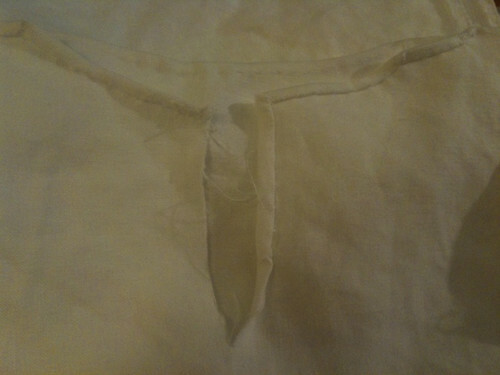 I have cut these out at 6″ as recommended for adults, but my hemming means that they are 4 ” square for sewing in. 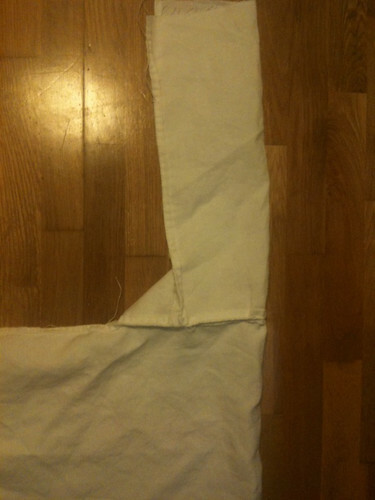 I then used these squares to make a diamon shape under the armpit with the bottom 2 sides of the diamond being sewn to the sides of the body, and the top 2 sides of the diamond sewn to the underarm seam of the arms. Makes a lot more sense with photos! Aha!! 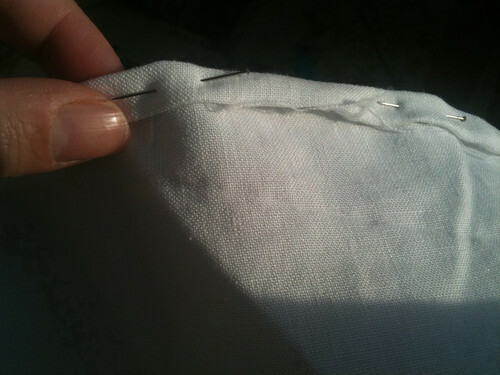 we have moved on I added hole so that BB could try on, following the steps in the tudor costume, making it 6″ transverse and 4″ vertical in the end to get over her big head I identified the midpoint with a pin, and checked a few times that i had the right horizantal space too. 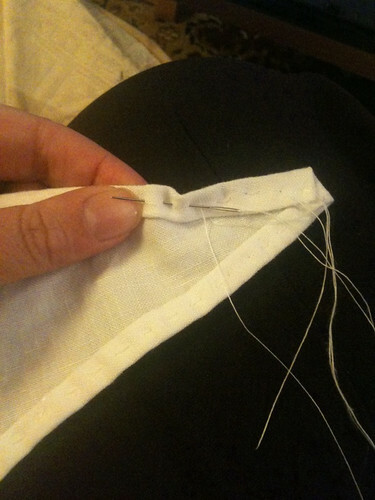 i then carefully hemmed a collar shape around the neck area along the line of design 2 with a narrow collar. I haven’t added the collar and tie as saw children with v plain necklines, and I know BB would prefer this less fussy approach. If necessary It won’t take long to add collar and tie. 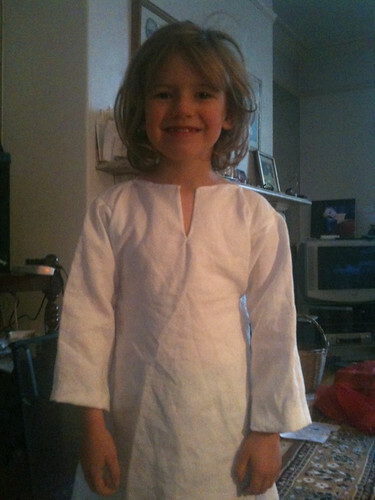 I then tacked the sleeves to where I think they should be now with a big hem tack, and then will do properly nearer the time incase arms have grown a lot longer. SO I am calling this done for now, tho it still needs finishing touches. BB plans to wear it as a nightie for a bit to soften it down and get comfortable. What I have learnt? to be much more generous with loose allowance next time. having been to kentwell i have also learnt something else – you need to have the wrist loose enough to push up the arms [mine were] and ideally you want a smaller horizantal slit across the neck even if you need a larger slit down the front, as it is the back of the neck and the shoulders where your children will burn.